Happy Long Weekend… the last one of the summer. Wow, i know it sounds so cliche but really, why does summer have to pass at lightening speed? You all have probably got my drift through recent posts and IG that i’m a clinger. Summer clinger! So i won’t bore you with the little somersaults that might just be going down in my belly at this moment. And instead, focus on what’s really cool about this Labor Day. Like many other holidays we keep some traditions alive on the eve of school’s start. Well, hockey tryouts are becoming a standard but thankfully Link’s ice time is 8-9 am which still leaves us with the full day. Labor Day isn’t over until there is a declared winning volleyball team. Yesterday night we did a little trash talking warmup and figured out some strategies for tomorrow…there were mid-game trades, squabbling about rules of play and a whole lot of confidence on both sides. 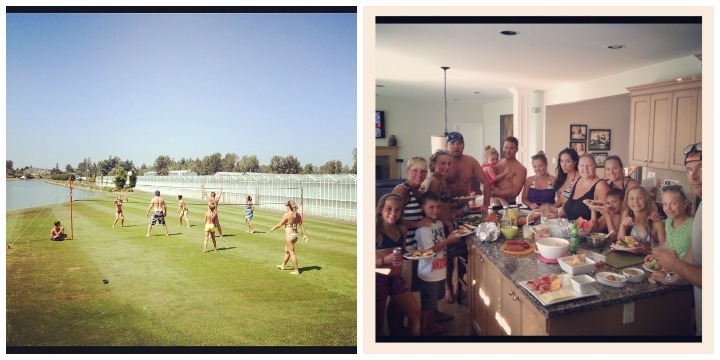 At this point it’s anyone’s game….winner of the Annual Labor Day Tourney 2014 TBA. An evening dinner with Scott’s side of the family …with a sprinkling of my side… is also an annual thing. This year my mom’s bringing it to the table with her home-made “rollkuchen”. If you know what this, I’m thinkin you’re nodding in agreement! And for those of you who haven’t heard of it, think deep fried pillows of dough dipped in Rogers Golden Syrup…and sides of farmer sausage and crisp watermelon. Summer cannot come to an end without eating this at least once! We also like to call this the Last Supper because come Tuesday, this body’s got to get back on track for REAL! And after the party has dispersed..early because darn it, we’re dealing with bed times again, it’s a tradition for my kid’s Auntie Jayme to go through the “first day of school” wardrobe and hair run down with them. Oh, thanking my lucky stars for Auntie Jayme and her infinite patience and hairdo skills for she has all the time in the world to help my girls feel special on that first day. It will be a bit different this year as Melina is going the Distance Ed route which means all the primping will go Lexi’s way this time. But this truly is a special moment that just wouldn’t feel right skipping out on.